Pro Home and Sunrooms provides homeowners in Rochester, New York, and the surrounding areas, several styles of sunroom that are perfect for relaxing or entertaining in. We are one of the area’s largest TEMO dealers and are proud to install their premium-quality, American-made sunrooms on the homes of our countless customers. A cathedral style sunroom is the ideal choice for homeowners that are trying to find a way to add both style and extra living space to their homes. Factory Cathedral – A factory cathedral sunroom offers full-view glass walls and requires additional height so it is the perfect choice for two or three story homes. Pro Home and Sunrooms is proud to offer high-quality products that are installed by factory-trained and -certified installers. We feel so strong about the products we offer and the work of our installers that we offer a limited lifetime transferable warranty to allow you to rest assured your investment remains protected for years to come. 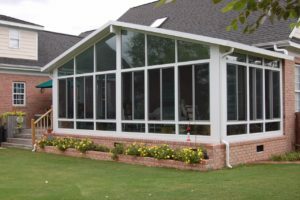 For more information about the cathedral sunrooms we install for homeowners in Rochester, NY, and the surrounding communities, contact Pro Home and Sunrooms today. Make sure to ask about the convenient financing options available to all qualifying homeowners.